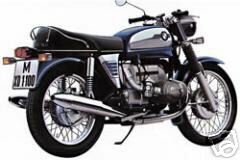 TAMIYA 16005 BMW R75/5 (1/6) scale model kit! Big-scale kit of a the BMW classic bike. Oversize. Soft tires and seat. Working front fork. Coiled spring suspension. Big and impressive.